Hello readers! So today is move in day for students on campus where I work at (Lehigh University). Looking at them move in, I thought to myself hmm, do they have everything they need? Seems like they have half of the stuff they need and will get the rest as the weeks pass along. With that in mind, I decided to make a list of some Dorm Room Essentials that would help them with the "Dorm Room Life" as I like to call it. So below is a checklist of what they will need but first follow these 3 easy steps! 2. Make room in your home to store your college dorm essentials as you acquire them. (Tip: Save money, pack the items you have at home first. For items you must buy, shop early to give yourself time to check purchases, make returns. Avoid procrastinating because move-in weekend at college is busy.) Just check out the list below! Confirming your class schedule and locating your classes; and so much more! Are you excited yet? Or feeling a little overwhelmed? Because while you're doing all of that, you will be attending mandatory activities, for you and your family, designed to give students a smart start at college and so that your parents can learn more about the Campus! Establish a Monthly Budget!! I cannot stress this enough! Everyone has stories about living off of Ramen soup and Bread. Don't do it! Follow my blog & subscribe! If you're on campus at Lehigh then shoot me an email so I can teach YOU how to coupon and get more BANG for your BUCK! 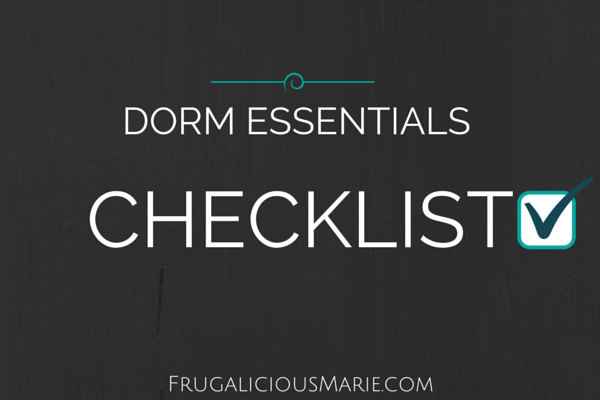 Download and Print your Dorm Room Checklist here!